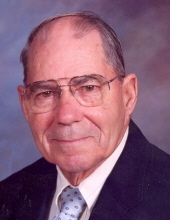 Duane Bricker, age 90, of Boone, died on October 14, 2018, at the Grandview Health Care Center in Dayton. Funeral Services will be held Thursday, October 18, 2018 at 11:00 am at the Schroeder-Reimers Memorial Chapel at Sixth and Marshall. Burial will be in the Sacred Heart Cemetery. Duane Wilbur Bricker, was born in rural Stratford, Iowa on July 22, 1928, the son of Wilbur and Gladys (Anderson) Bricker. He graduated from Dayton High School in 1946, and on April 14, 1956, Duane married Velma Nelson, at Saints Peter and Paul Catholic Church, north of Gilbert, Iowa. He served with the Iowa National Guard from 1951 until 1954. In earlier years, Duane owned and operated the former Champlain Gas Station at 6th and Story in Boone. Later, he worked for Thompson Distribution and the Western Auto Store, both formerly in Boone. From 1963 to 1990, when he retired, Duane worked for Fareway Stores, first as a truck driver and later as a warehouseman. He enjoyed playing golf, dancing, playing cards, and camping. Velma and Duane spent the winter months in Mission and McAllen, Texas. He was preceded in death by his wife Velma in 2008; his parents, a brother in infancy, Doran Lee; two sisters, Glenda Paris and Carol Moeller. Duane is survived by his two sons, Jeff Bricker and his wife, Cyndi Bowlby, of Fort Dodge and Joe Bricker and wife, Terri, of Boone; two grandchildren, Josy and Brycen Bricker of Boone; a sister, Ramona Lind of Pocahontas; and numerous nieces and nephews. Friends may call at the Schroeder-Reimers Memorial Chapel at Sixth and Marshall, on Wednesday, October 17, 2018 from 4 pm until 7 pm. The family will be present from 5 pm until 7 pm. Visitation continues Thursday, October 18, 2018 from 9:00 am until the time of the service at the Chapel. To send flowers or a remembrance gift to the family of Duane Bricker, please visit our Tribute Store. The family will be present from 5 - 7 pm. "Email Address" would like to share the life celebration of Duane Bricker. Click on the "link" to go to share a favorite memory or leave a condolence message for the family.